Hunting for French vintage pieces in a Paris flea market is a great experience even if no treasures are found. If you have ever seen Paris After Midnight, you understand why. Strolling through small, winding streets filled with odd collections transports you to another era and to another lifestyle. Joie de vivre fills the air as you talk with French dealers offering inherited linens, odd pieces of flatware, figurines, bottles, anything and everything. Finding French vintage objects is more than the objects; finding French vintage items includes the entire joie de vivre experience of the Paris flea market. What do you do with vintage French flea market finds is a question that often comes to our minds when we find a special treasure. 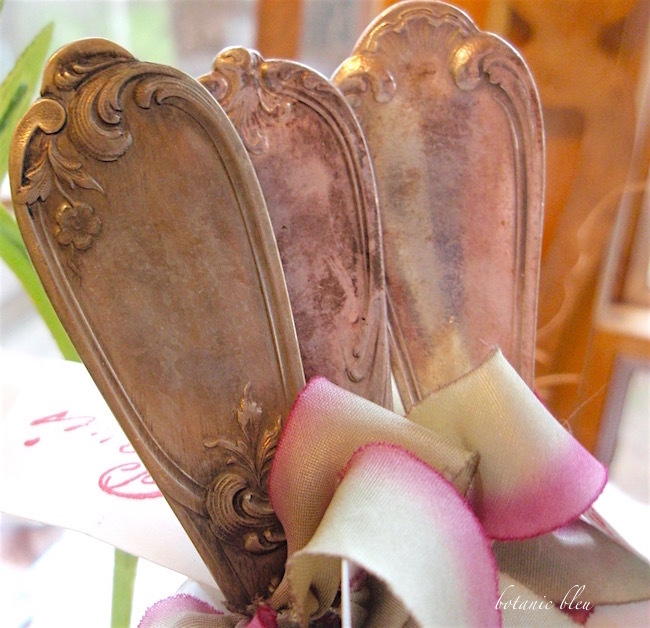 Here are five ways I have enjoyed using vintage French silver plate forks in my home. Number five is my favorite way for using a mismatched silver plate fork. Maybe one or more of the ways will also be just the idea that sparks how you can use a flea market find in your home. Marché aux Puces (flea market) Clignancourt in Paris is the largest flea market in Paris and perhaps, the best well known. Accordingly, the prices reflect its status and quality of goods. 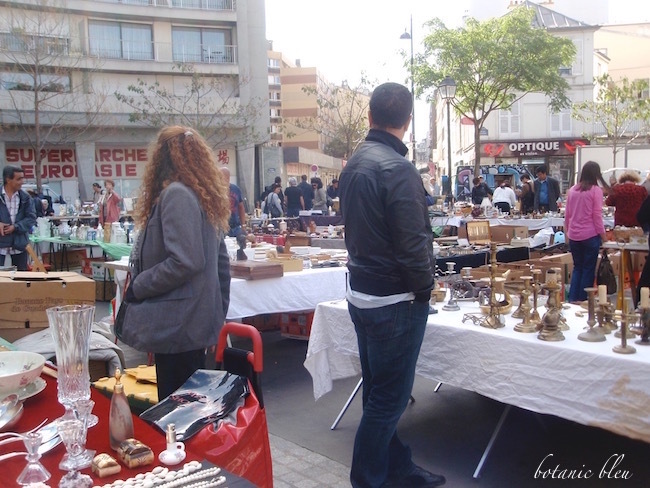 For those of us looking for the fabled flea markets where bargains can still be found, the smaller open-air Marché aux Puces d'Aligre is the one to visit. Real bargains take a little work. The Wednesday I visited d'Aligre, there was a dealer who had a HUGE cardboard box filled with odd pieces of old flatware. From the box's condition, it was clear it had sat out in rain as well as in sunshine. There were forks, spoons, and knives, all jumbled together, looking rather beat up and tarnished. Most were plain with little or no detailed patterns. After several minutes digging through the top-to-mid layers in the box, I found four forks with similar detailed patterns. No two matched, but all had beautiful raised patterns. Dirty and tarnished, I was not sure the forks could be brought back to their original shiny splendor, but they were a bargain and authentic French vintage flatware. What do you do with four mismatched tarnished forks? Flea market finds make unique gifts. 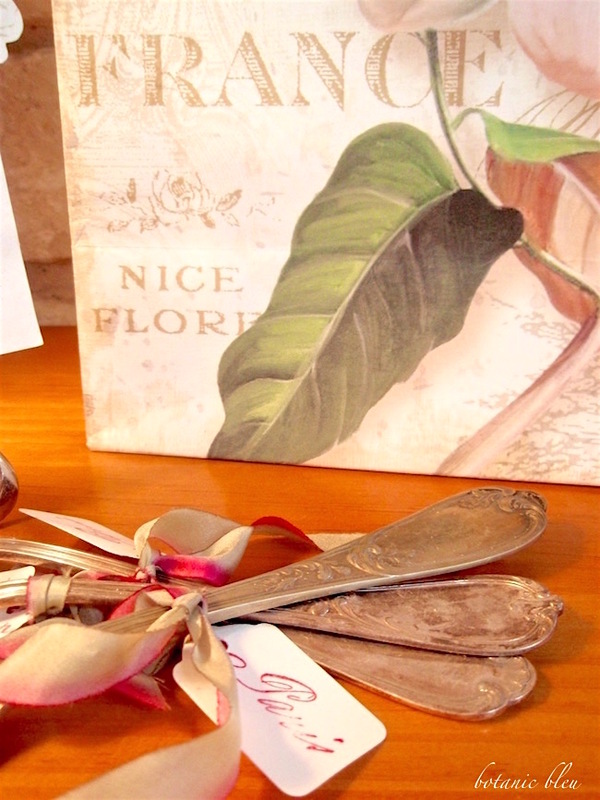 For friends who enjoy French-style decor, a tarnished fork from Paris is a special treasure they cannot find in local stores. Of course, knowing a friend likes or appreciates tarnish is important. Display the forks tied with silk ribbons and hand-stamped Paris tags. Lying on a chest in the living room they add French romance to a Valentine arrangement. Silver goes well with glass Christmas trees, and a little tarnish blends with vintage sheet music embellished with handmade angel wings. 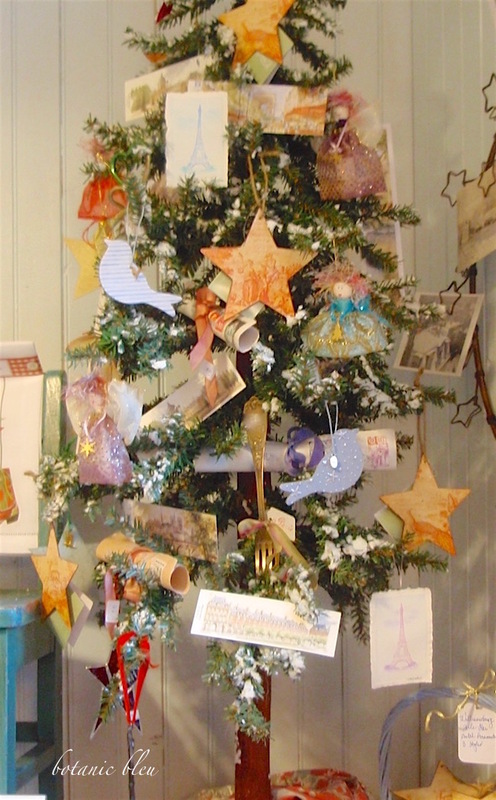 Adding a vintage French flea market fork to a small tree filled with handmade angels, narrow cards with Paris scenes, hand-stamped Eiffel Tower cards, rolled French alphabet pages, star ornaments with French toile scenes, and handmade bird ornaments adds another ornament with a French connection. 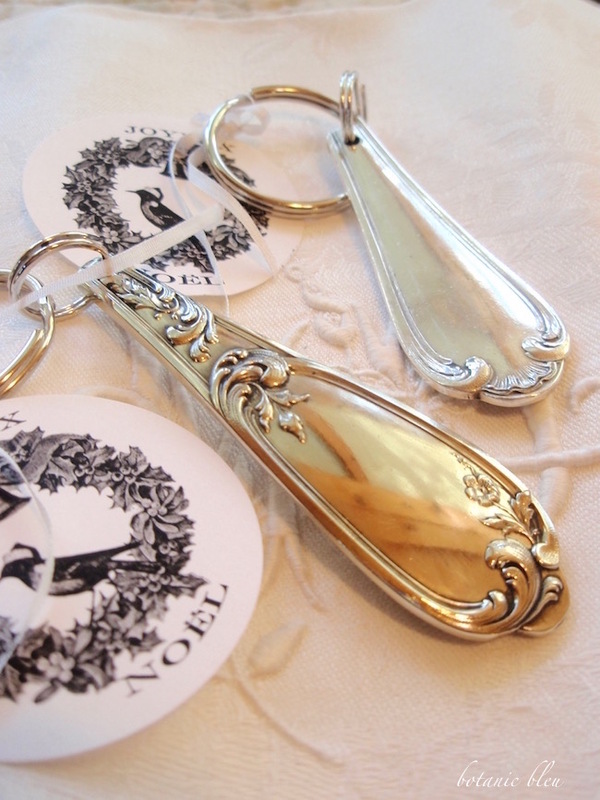 Repurposing the handles of the vintage silver plate forks as key rings is a beautiful way to enjoy the French flea market finds every day. Cut the handle so the entire pattern is included in the key ring. Polish with silver polish to bring back the luster of the silver plate. The shine is so bright on these that one of the handles is reflecting the wall posts and beams and looks gold colored from the reflection. Drill a small hole in the handle for a small connecting split ring. Attach the small split ring to a larger split ring that can hold several keys. Hardware stores usually carry a selection of split rings. The key rings make beautiful Christmas stocking stuffers. Add a small Christmas card using a narrow white silk ribbon to use as a gift card. Do you have an idea for another way to use flea market forks? See French Country Christmas Event flyer for details about the event. See the Botanic Bleu Facebook page for photos of items offered in this year's sale. 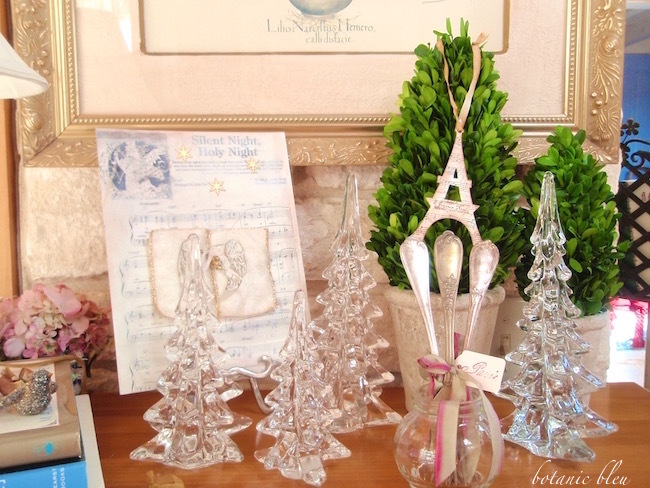 I would love to meet you during the French Country Christmas Event. A collection of truly great ideas! I love the jewelry they make with the handles and I have a bracelet and ring I wear all the time. But if they were mine, I would stand them up in a pretty jar to look at and enjoy. What fun to shop in Paris...oh my! Hugs! You know I am a fiend for silver....tarnished or not! I love all the ways you've displayed them and really love those key chains! Can't wait to be shopping at your sale!! Love and hugs to you sweet friend and I hope you and your family have a wonderfully blessed Thanksgiving!! Neat ideas and love the detail in vintage silverware. I have my grandmas pattern and really need to clean it and start using it again. Love the key chain idea. 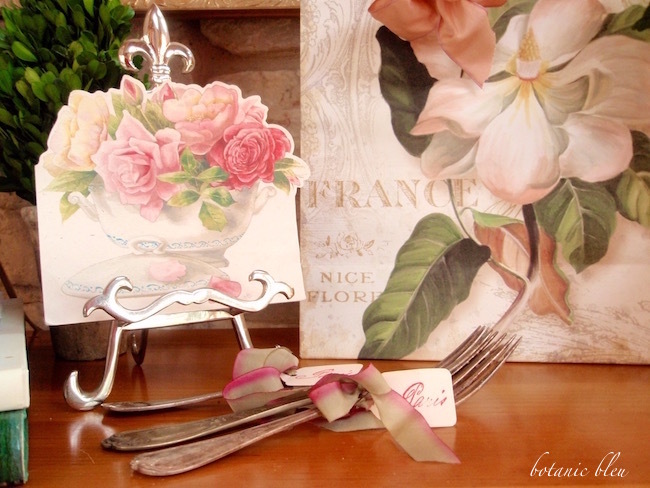 Years ago we use to dress old silverware up with dried flowers and ribbon. HOpe you enjoy a nice Thanksgiving Judith. Those are wonderful ideas! I, too, like the last option the most. I hope you have a wonderful Thanksgiving! All are great ideas, but the key ring idea is brilliant!! 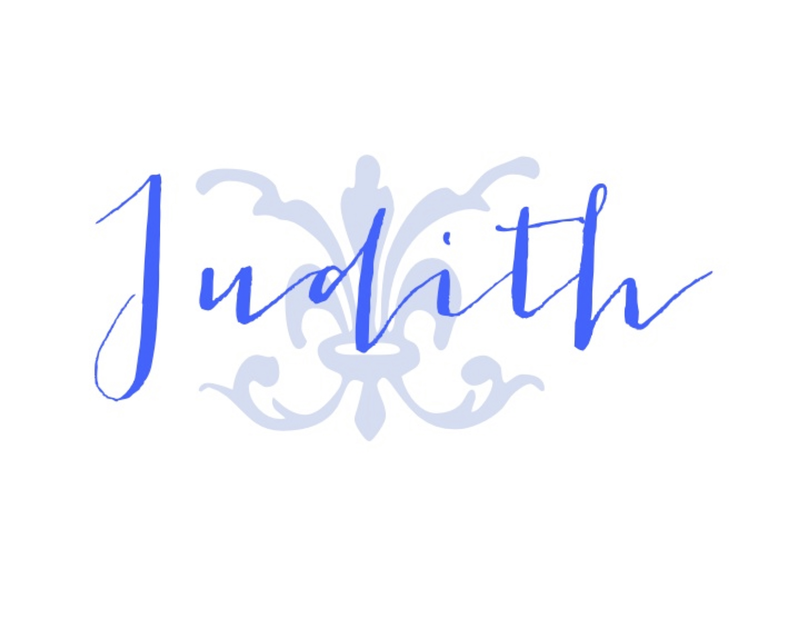 I would take it one step further and have the spoon handle monogrammed with your initials, or the date of your Parisian vacation or any particular monogram that has meaning to you. Have a wonderful Thanksgiving and a BIG thank you for giving me a great gift idea!! They are lovely forks. I'd use them on the table. I love to mix patterns of flatware. Your forks look very romantic tied with the gorgeous silk ribbon. They make darling key rings. Precious ideas and keepsakes. These are great ideas! I have some mismatched demitasse spoons I use for my tea.